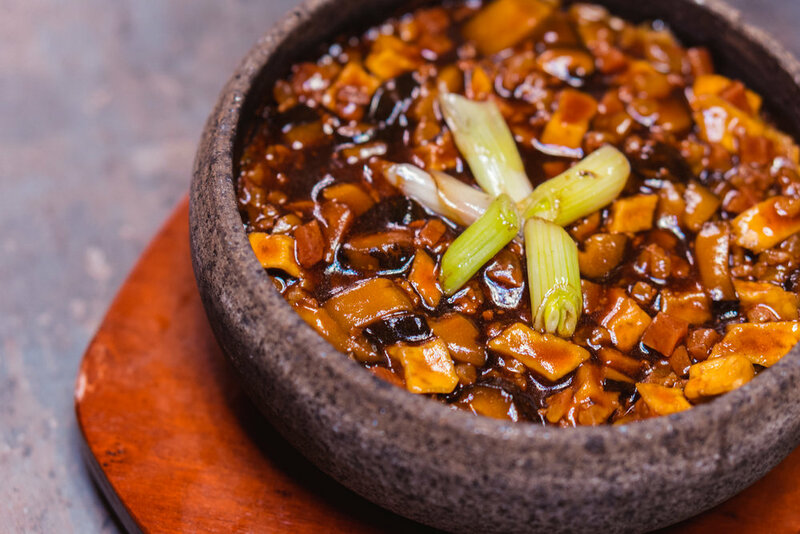 What I like about Blue Lotus is how they're decidedly contemporary with a healthy influx of Western touches, but yet still true to the spirit of Chinese cuisine. In their signature Blue Lotus Yu Sheng (regular $48; large $68; also available for take-away), shredded greens and pickles are switched out for a fresh, leafy salad with sprinkles of fried sweet potato, crisp rice vermicelli, deep fried ginger and dill. Then sea-kissed with Norwegian smoked salmon and Sakura ebi, and garnished with 3 types of candied nuts. A choice of spring onion-infused olive oil and a unique Yuzu Kumquat dressing makes for a uniquely refreshing, both savoury and zingy at the same time, crunch of textures. With a toothsome egg-fried rice base, the Hot Stone Fried Rice with Chinese Sausages & Shitake Mushrooms ($26) is an easy crowd-pleaser. The hot stone bowl doubles the aroma of the Chinese sausages and rice with its hardworking, sullen sizzle—and if you managed to request for a side of in-house fried lard, that adds another layer of gleaming smoothness and flavour. Or you could just go straight for the Hot Stone Pork Lard Truffle Flavoured Fried Rice. This year, Blue Lotus has also added Carrot Cake and Yam Cake—best matched with their own superb and spicy XO Chilli—to their line up of artisanal Nian Gao's, presented in an elegant Tingkat carrier ($38 for 4). I don't usually take a liking to Nian Gao’s, but their Red Date one is super tender and soft, and has a mellow sweetness that grows on you. They've also consolidated Chinese New Year menus across Blue Lotus Chinese Eating House and Blue Lotus Chinese Grill House outlets this year, ranging from Happiness( $68 per pax; complimentary Nian Gao Goodies with min. 6 pax), Longevity (min. 4, $88 per pax; complimentary bottle of Tomintoul 12 Years Single Malt Whisky min. 8 pax) and Prosperity(min. 2, $108 per pax; complimentary Blue Lotus Slow-Roasted Spanish-Style Suckling Pig with min. 10 pax). Blue Lotus’ Chinese New Year menus are available through 19 February 2019. For details and online reservations, visit https://www.bluelotus.com.sg/chinese-new-year-2019/. For intimate group celebrations, the Blue Lotus Chinese Grill House at Tanjong Pagar has a private room that accommodates up to 16 people and comes fully equipped with an AV system for karaoke sessions (or presentations).